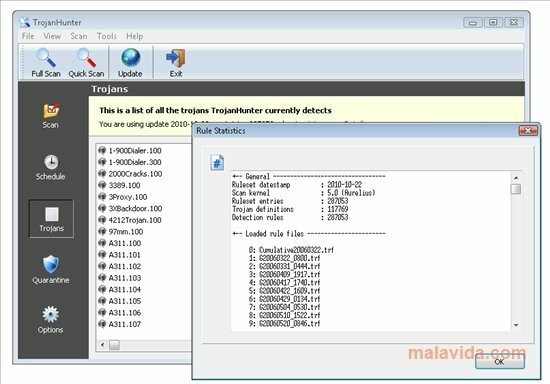 TrojanHunter is a program developed to eliminate any kind of Trojan that has sneaked into your system or to avoid being infected by any of the threats that may arrive on the Internet. This kind of malware is usually hidden in programs that seem to be totally clean and can be used to have remote access to a PC. The application has a large database that usually updates very often, even though it also allows the user to create his/her own entries manually. The tool checks the Windows Registry file, the hard drives and the RAM memory in search of any kind of threat, with the objective of eliminating any danger. The program has some utilities that may help you to detect any danger, like a process manager, a tool to see the open windows (even if they are invisible) and a memory analyzer (to search for a threat in the RAM memory). Discover a program with which you can avoid being affected by one of the worst Internet threats, thanks to TojanHunter.